Why Israel? Why now? Israel is exciting, rich in history and diversity, safe, and surprisingly affordable. Experienced custom tour guide Jeff Abel can put together an itinerary for you and your family and create the holiday of a lifetime. 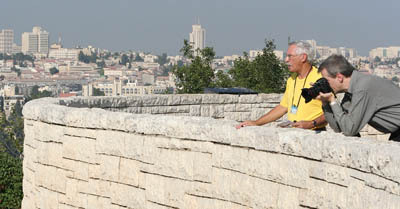 Jeff Abel has been guiding custom and group tours of Israel for many years. He knows the geography and the ancient, modern and religious history of this part of the world inside out - but more importantly, he understands his customers' needs. That understanding comes in part from his broad background. Jeff is well read, an experienced busines manager, a writer and an editor. Having been trained at the University of Natal in the fields of Economics and Phychology, at the Hebrew University in History, where he pursued graduate studies, Jeff occasionally edits academic publications and writes popular articles. He has written for the Ministry of Tourism, church journals, Hilton hotel magazines and the Hebrew University's Scopus. But above all, Jeff is an experienced, officially licensed Israeli tourist guide. He guides groups on a luxury bus; otherwise he drives you around in the "Jeffmobile": a government-licensed people-carrier that takes you and your family around Israel with ease and in comfort. For those who like to take charge, Jeff is as flexible as you could wish. For those who want to just relax, Jeff will arrange all the details of your trip, all the entrance fees, and all other formalities. He will pick you up when you arrive at the airport: you simply have nothing to do but enjoy the trip. Over the years, Jeff has guided many families, celebrities, tour groups and individuals on customised tours. Whether you want to tour for two weeks with your family, or just for a day or two in between business meetings or conferences, Jeff will help make your visit to Israel memorable. He enjoys his job because he likes people ( he says that there are also benefits to being a guide) and people respond by liking Jeff. Please check out some of his references. Especially if this is your first visit to Israel, Jeff understands that you may have many questions: please do not hesitate to contact him today. If he is unavailable, he will provide you with, or refer you to an alternative, suitable guide. Israel is an easy country to visit. To get you started on preparing your trip, here are some practical tips.